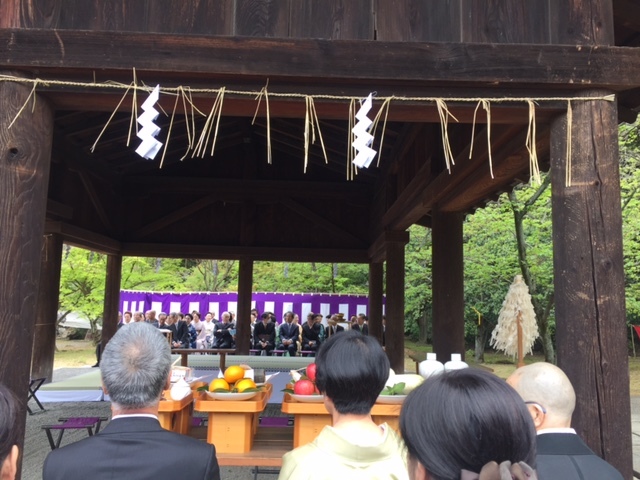 Midorikai was honored to be invited to Hokoku Jinja Kenchashiki Sanretsu, which is offered every other year. This memorial is to honor Toyotomi Hideyoshi, who has sort of a complicated relationship with tea people. On one hand, he was very important in Kyoto’s history and did a lot of good things for the city. On the other hand, he was responsible for Rikyu having to commit seppuku. We all wore our formal iromuji (one color) kimono and fukuro obi. 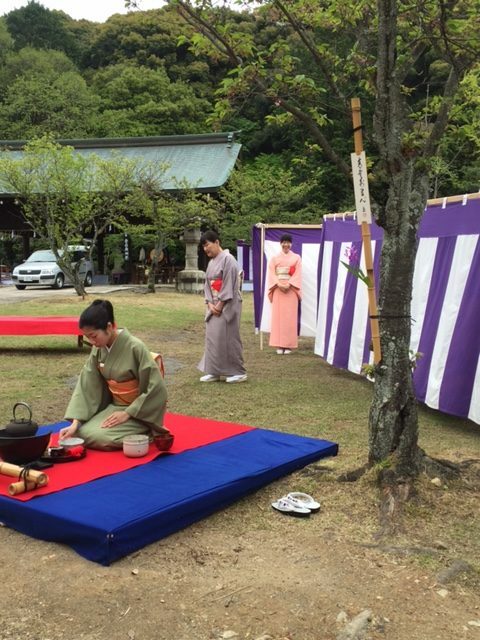 The men looked very nice in hakama. Even though there was a forecast for 60% chance rain, it didn’t rain on us but it was pleasantly overcast. We enjoyed three seki. 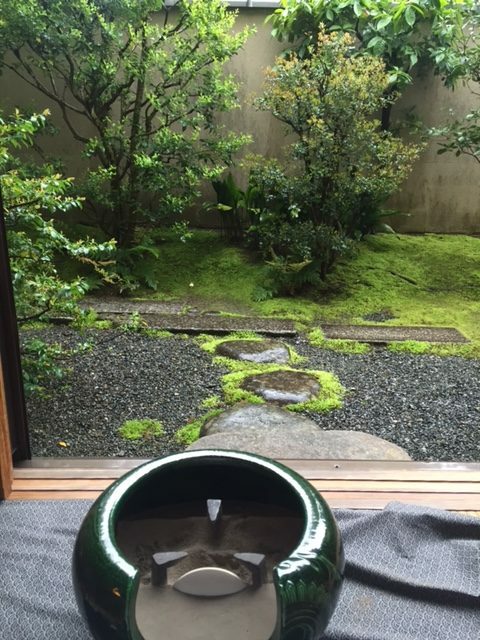 The first seki was at the foot of the tall stairs and O’Iemoto-sama offered the ceremonial tea. It was very small and intimate with about 40-50 people on each side of the platform seated in chairs. I was fortunate to not have a pillar blocking my view so I was able to watch everything clearly. The priests purified the guests and the food offerings. It was fascinating. Plus O’Iemoto’s temae was lovely. The second seki was by the older Gakuen students outside on the red felt tables. They served hanami dango – delicious! Each colored ball was a different flavor. After matcha, we went to the third seki. This seki was also small with about 20 Gakuen and Midorikai students, and SURPRISE, O’Iemoto himself came out to give the explanation while a gyotei sensei did temae! I’ve heard that this was quite unusual! There was so much famous dogu (Tantansai, Gengensai, Ennosai, Daisosho-sama, etc.) but the creme de la creme was a hanaire (flower holder) of a massive bamboo root made by Hideyoshi himself! It was definitely impressive. One could see why a powerful man like Hideyoshi would have been drawn to something as ostentatious as this. It was truely a thing of beauty though. We had tenshin meal served by the male Gakuen students afterward and that was also very tasty. There were three awesome scrolls, sadly I can’t remember any of them right now in the flurry of activity and things to look at, so I will have to look at the daily practice log to remind myself and make note. Afterward we (Toni-san and I) had another mizuya toban meeting in preparation for our mizuya week to begin on the 24th. It was nice to be introduced to the 15 other people in our group. What an amazing day! We have also started to do our own haigata, ash forming. Here was my binkake and view. Note: I had some assistance on that front mountain. I’m not that experienced yet and will need lots of practice. Spring rains are always so refreshing and the garden was just lovely. Oiemoto and Gyotei – how wonderful! It sounds like a lovely day. From Karla: Sinton S., Thank you very much for your kind words and for reading the blog. I hope to continue to blog about my adventures. Cheers! Thank you for your comment. I will make sure Karla receives your feedback. Thank you for taking the time to comment. I am looking forward to seeing you more on the blog. Thank you for sharing your experience. Looking forward to further posts.